Bill's AC & Heating Corp - Lake County's Heating and Air Conditioning Expert - Services - We will service or repair your current AC Unit or supply you with a new one that is more energy efficient than your old one! 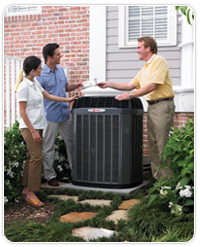 Bill's AC & Heating Corp can ensure that your home will stay comfortable year-round. Should you require Heating and A/C service on your home or business our skilled technicians have the know-how to diagnose and adjust or repair your system so that you are comfortable all year long. Preventative Maintenance: We offer residential and commercial preventative maintenance agreements for homes and businesses of any size. Duct Work: Do you find yourself adjusting the thermostat to cool your master bedroom? We will design the ideal duct configuration for your specific home layout. EarthWise™ Design Approach: Our comfort specialists understand the importance of energy conservation. We take the time to educate home and business owners on Trane's EarthWise™ Hybrid Systems to help lower your heating & cooling costs, while helping our planet at the same time. Call us for a free consultation!